Green Man ~ Synergy: “Green Man is Earth’s vegetation personified. Although he has many variations, this card depicts a more subtle and embedded representation. In other portrayals, he resembles the face of a man covered in green foliage as branches and vines sprout from every direction. 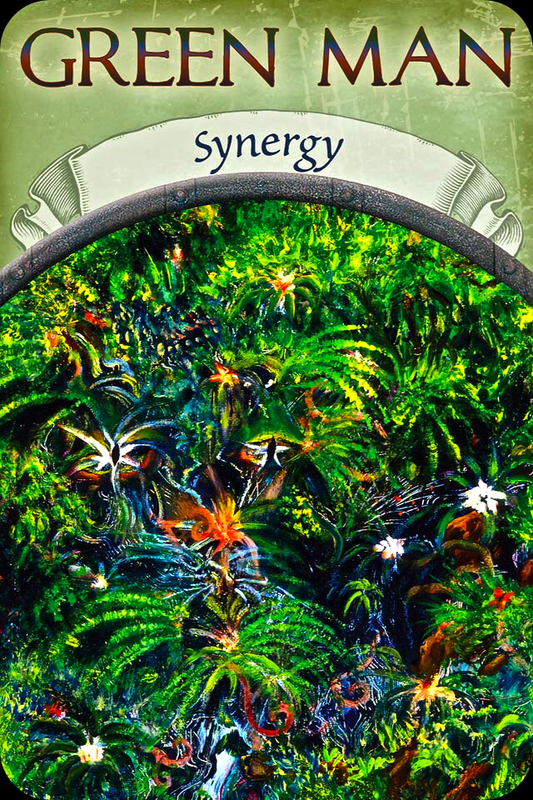 This message is about seeing the bigger picture… the connection to All That Is, and your integral part in it. When you acknowledge this connection, it helps to align you, body, mind and spirit with the forces of the Universe, the planet herself and all of her creations. When these forces all come into synergistic balance, it is like a perfectly oiled machine; each contributing to the other in harmony. This alignment is very healing for you, and in turn, healing to the Earth. It helps you to see that the world is so much more abundant than our fears will allow us to realize; that there are endless opportunities and possibilities open to us in every moment. If we just open to see them and receive them. You are being reminded to see the bigger picture in your own life. Release the drama, worry, fears and doubts which play out in your head regarding your personal lack or limitation. Focus instead on the beauty and magic within you reflected in nature all around you. You are as stunning and intricate as the most delicate snowflake; as gorgeous as a brightly coloured butterfly; as strongly grounded as the mighty oak; as serene as the pastel sunset; as wise as the full moon; as passionate as the blazing sun; as abundant as the double rainbow and as pure as the deep blue ocean … you are made up of the same stardust as all of these things. Witness this deep Soul beauty in yourself with awe and wonder and see the connection to All That Is in your own eyes. When you can do this, you can connect with the most powerful force in the Universe and use it to heal everything and everyone.